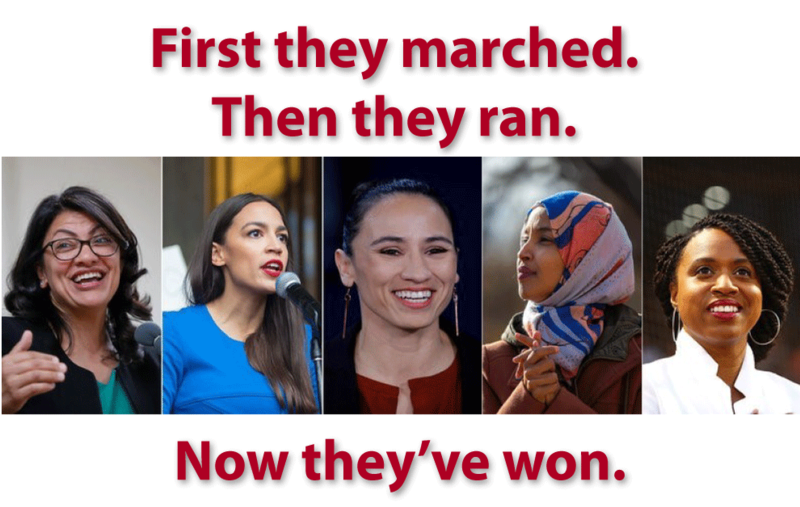 First they marched. Then they ran. Now they’ve won. This is the beginning of the holiday time of the year. I wish you and yours a Joyous Thanksgiving as the first in this winter celebrations . Because Thanksgiving is in the season of gratitude, I wanted to send you a quick message in acknowledgment and celebration of this historic moment for women leaders. ● Women surpassed the current record of 107 voting members of the House and Senate with a total of 118 – and counting. ● The House will have the largest number of freshmen women of color with at least 11 new members elected. ● 13 women have been elected to the Senate so far. ● Nine women were elected governor, matching a record set in 2004. ● Firsts: Native American women, Muslim women, female senator from Tennesee and Arizona, Hispanic women representing Texas, woman governor of South Dakota, 153 LGBT male and females and first openly gay legislator in Kansas (preliminary stats as of Nov. 7). How exciting, and important, it is to have a legislature that looks more like America than ever before! It is not only a question of gender, but of reaching more balance in masculine and feminine leadership. Congratulations to all women who ran, won, and supported this record-breaking election. Let’s keep it up! Be courageous – Dare 2 Lead!